When I was in high school, I went out for track and field. I was a fairly decent short-distance runner, but I was horrible at long-distance runs. What’s more, I hated to practice. But if I happened to see a pretty girl in the grandstands, I found new motivation for running my best. As we run this race of life, we have a better motivation than I had in high school. We run for an audience of one: Jesus Christ. He is watching us. He is praying for us. In fact, the Bible tells us that He lives forever to intercede for us (see Hebrews 7:25, NLT). This is what gave young Stephen courage when he stood before his accusers who were ready to put him to death. Full of the Holy Spirit, he was given a glimpse of Jesus in heaven and said, “Look, I see the heavens opened and the Son of Man standing in the place of honor at God’s right hand!”(Acts 7:56 NLT). Seeing Jesus gave Stephen the ability to run the race and finish it. Seeing Jesus also gave Simon Peter the ability to walk on water. As he kept the Lord in sight, He did the impossible. It’s so important for us to keep our eyes on Jesus. Why? Because circumstances will disappoint and, at times, devastate us. People will let us down and will fall short of our expectations. Feelings will come and go. But Jesus always will be there to cheer us on. He has run before you, He is the ultimate winner, and He will show you how to run. But you have to keep looking to Him. 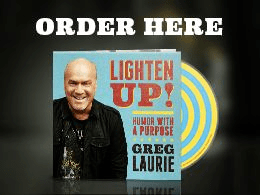 Pastor Greg’s staff has compiled a collection on CD of humorous stories that Pastor Greg has told over the years. And along with each funny story is the biblical point it illustrates. It’s called Lighten Up! Humor with a Purpose.